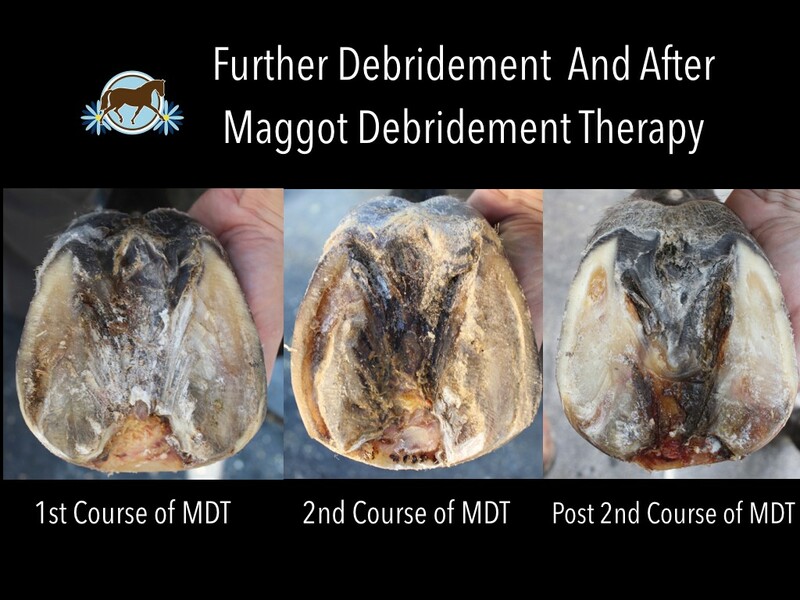 One of the most unusual yet incredibly interesting tools I use in my work with foundered horses is Maggot Debridement Therapy (MDT). 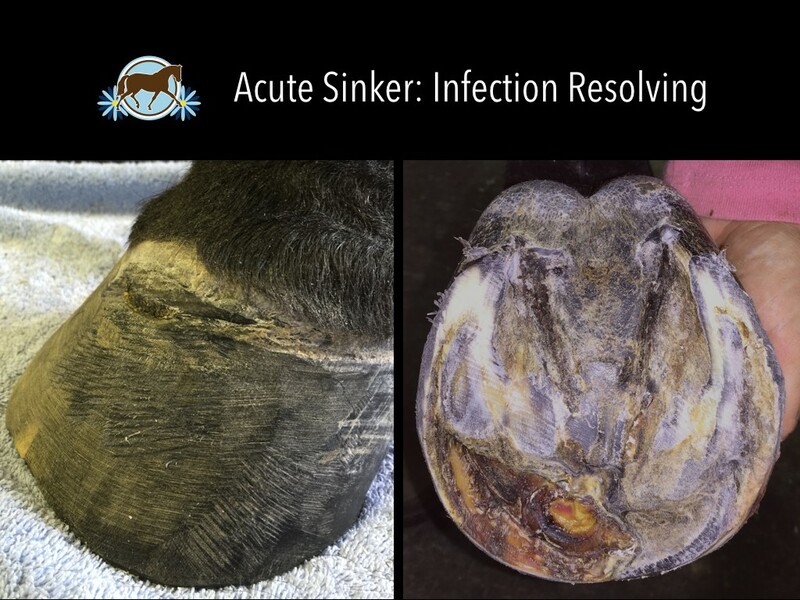 There are many different approaches to working on resolving these infections between the farrier and veterinarian: drawing poultices and soaks, antibiotics, debridement of infected tissue, anti-microbial hoof soaks, and topical cleaning materials are commonly used with varying degree of success. 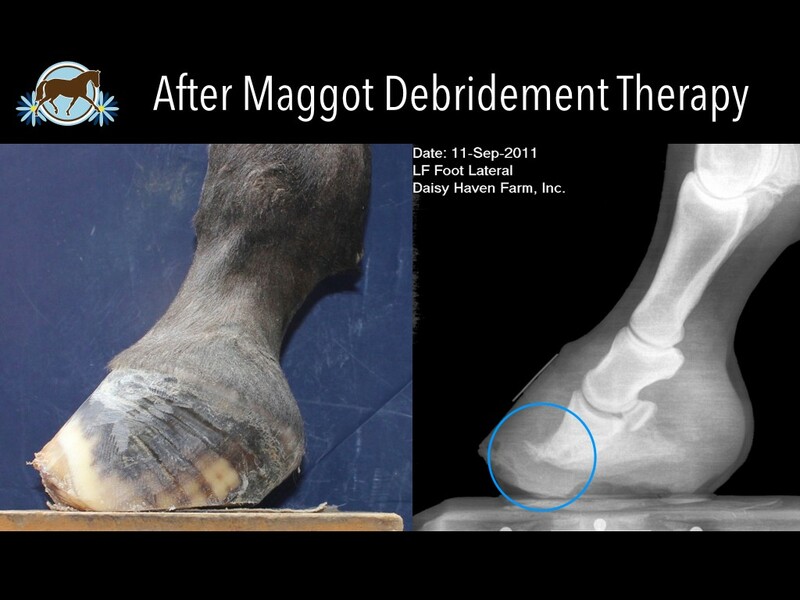 Since 2005 I have used Maggot Debridement Therapy, in conjunction with other supportive therapies and veterinarian guidance, on over 100 hooves with tremendous success in resolving chronic hoof infection in the laminitic horse. 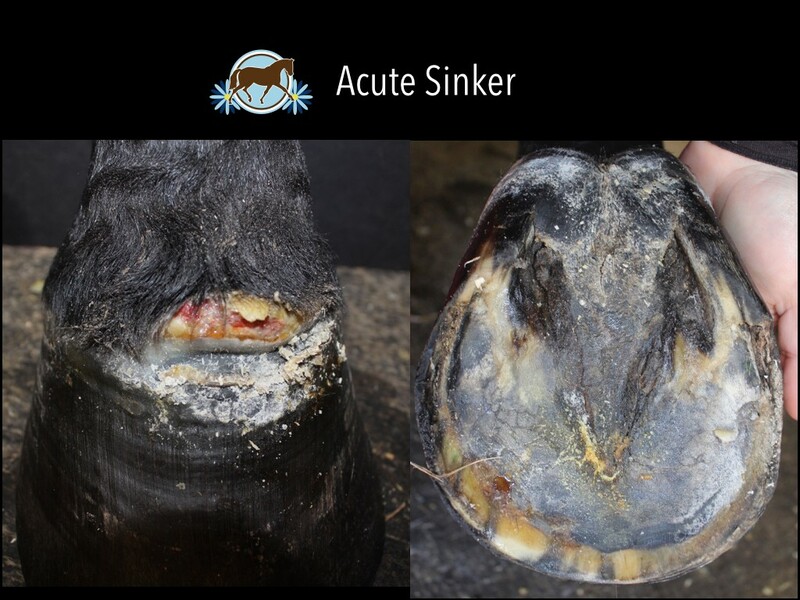 In 2011 I won an award for a Scientific Poster I presented at the Laminitis Conference on my method of application, which is inexpensive and can be applied at home by the farrier, veterinarian or even horse owner successfully. 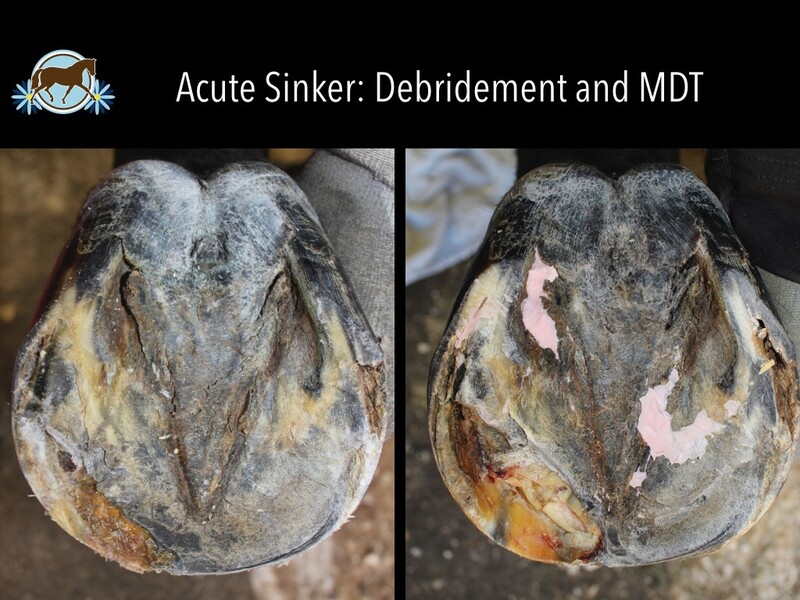 My message was that MDT can be affordable, easy, and should be more accessible for treatment of chronic infections for the laminitic horse. 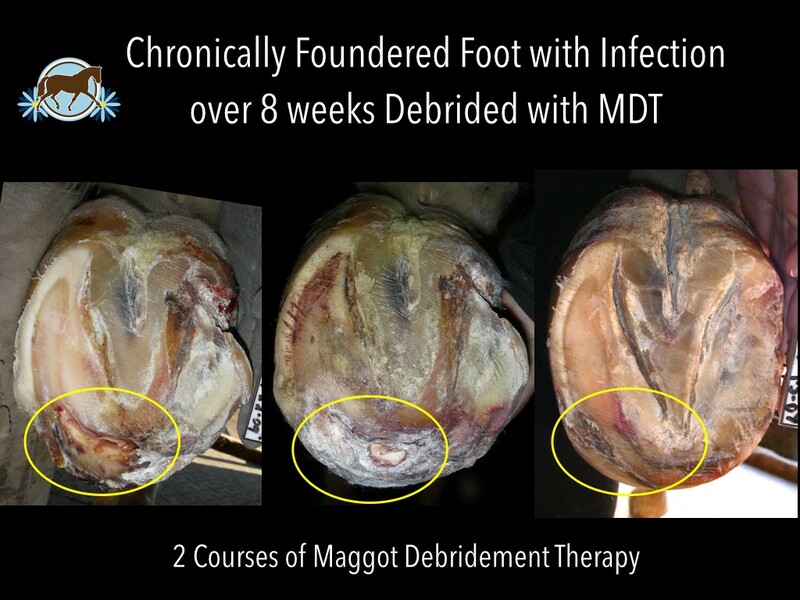 The idea of maggots eating away at the foot may really turn you off. If so, I understand. 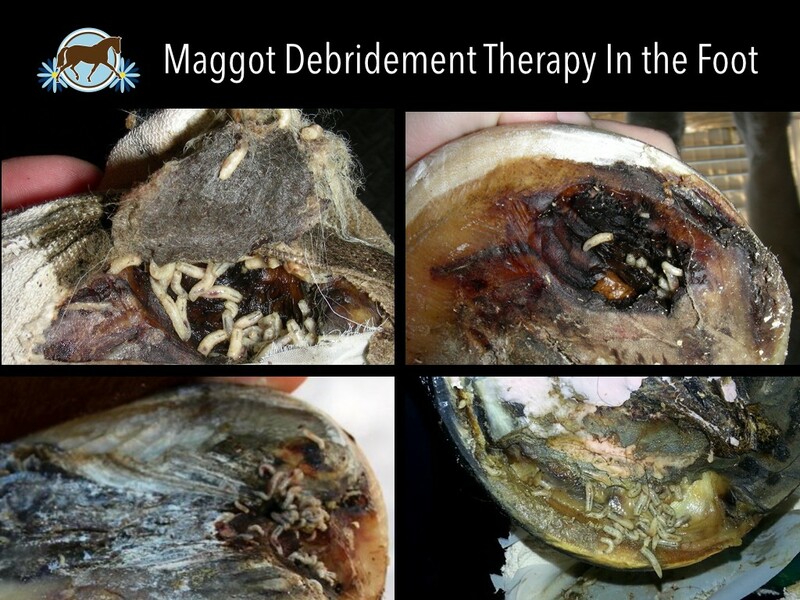 Keep in mind these maggots are specifically designed to only eat necrotic tissue, not live healthy tissue. 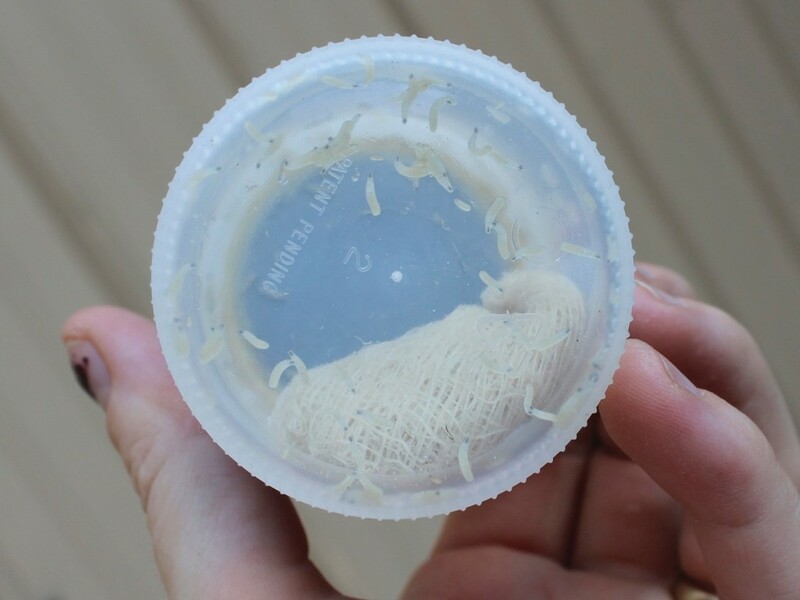 They are also sterile, so they will not reproduce. 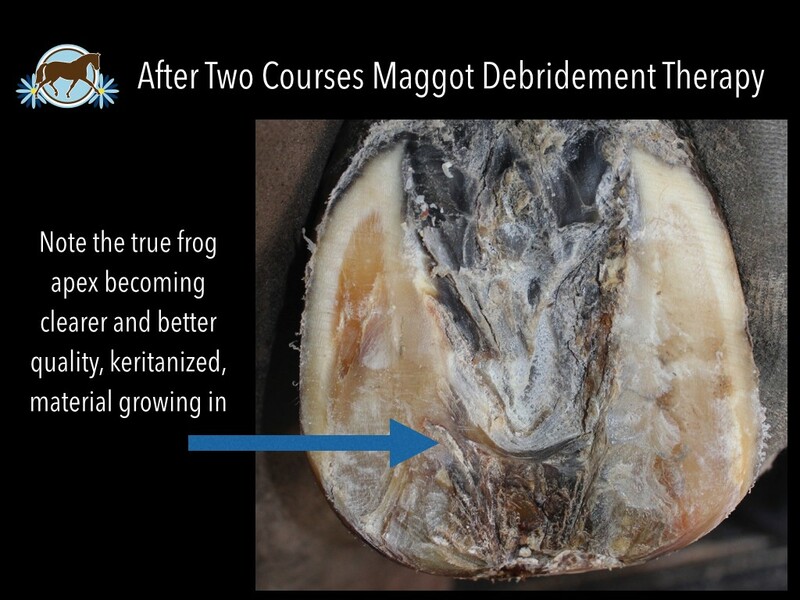 Their saliva and exudate further break down infection, and the maggots stimulate new cells to grow and keritanize, which is critical to healing. They are amazing critters! 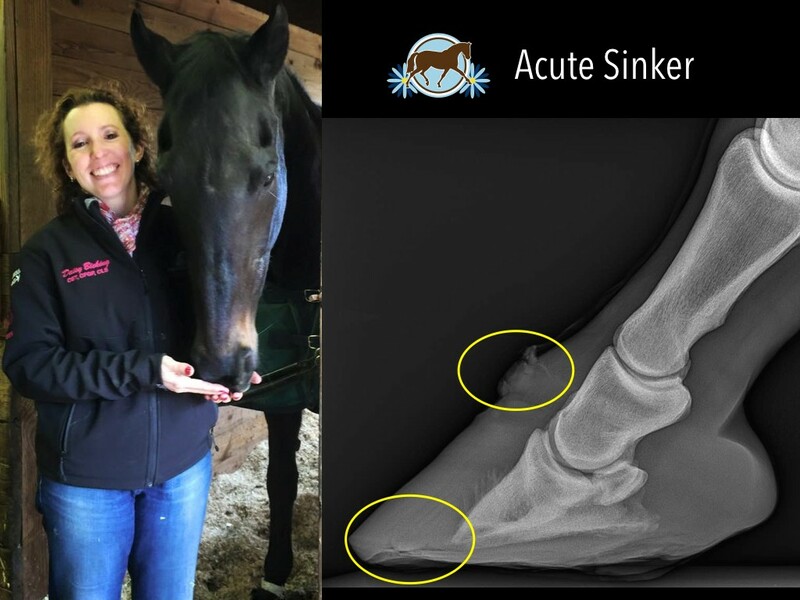 I admit I have a bit of a love affair with them, at least when intentionally put in the foot for therapeutic purpose. 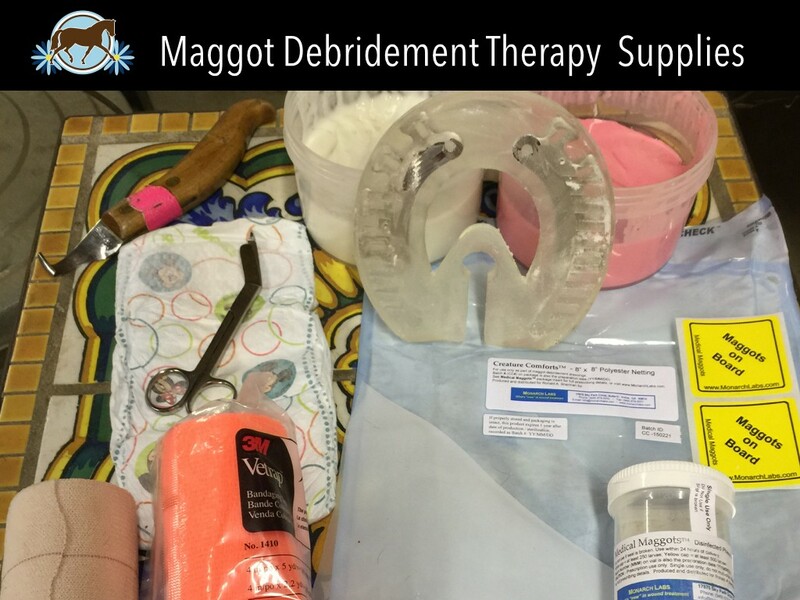 With any therapy, success is largely dependent on managing the multitude of factors impacting the given situation. 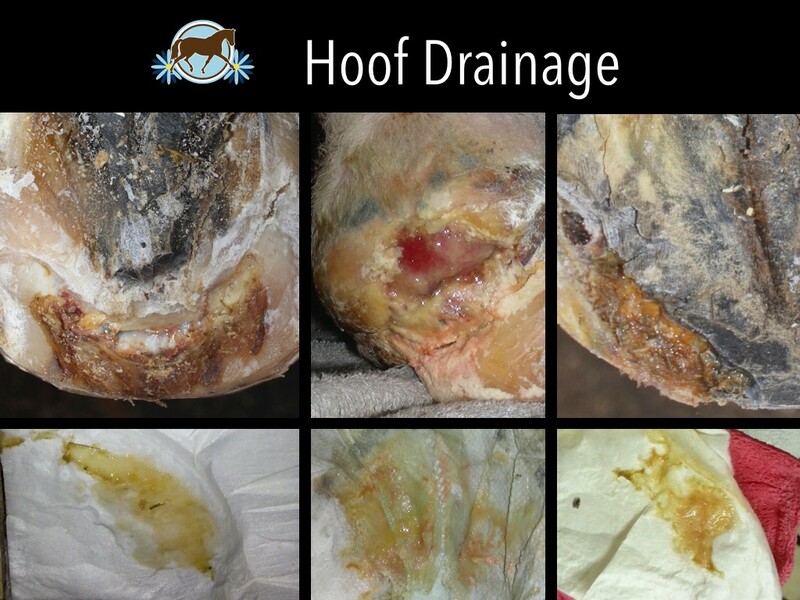 In this horse’s case, we had a lot of room for improvement with the trim alone. 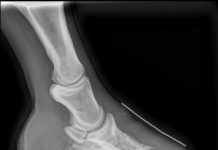 We trimmed her to the protocols I’ve mentioned in pervious blogs like this one here, and also worked with the veterinarian to rule out any metabolic or other underlying issues. 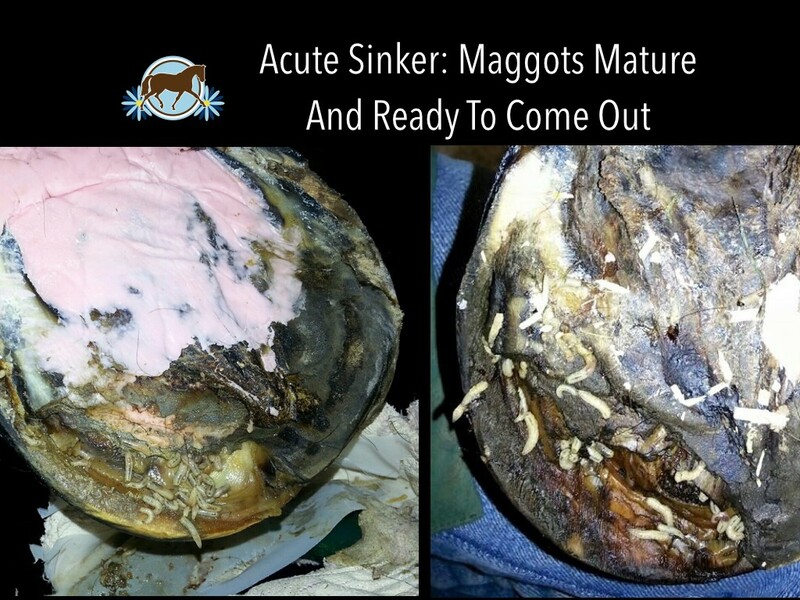 Maggots mature around 3-7 days and grow to approximately 1cm in size. 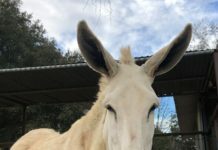 They start with a black dot on their head, and grow a brown stripe down their back. When the stripe reaches their tail they are mature. Their instincts cue them to seek ground to turn into flies and they will stop eating, so can be removed. 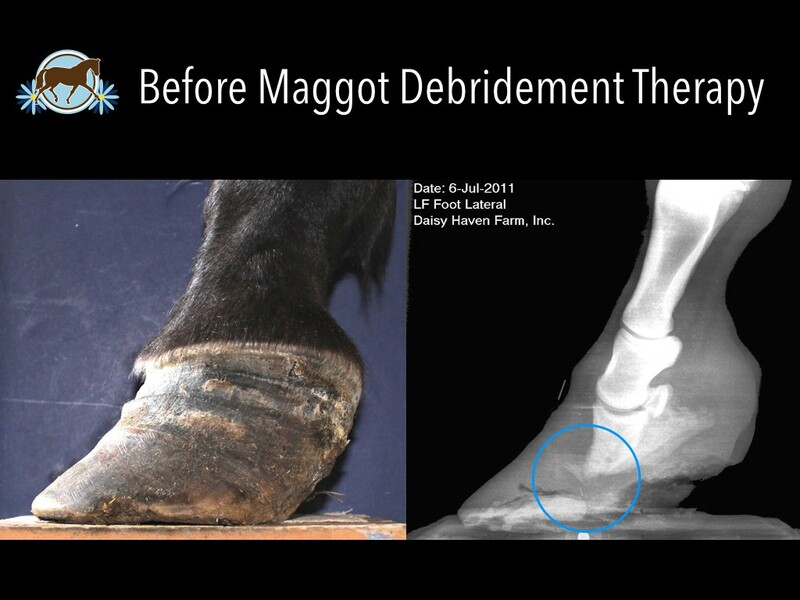 I feel very fortunate to have a tool like Maggot Debridement Therapy to help resolve chronic foot infections for laminitic horses. 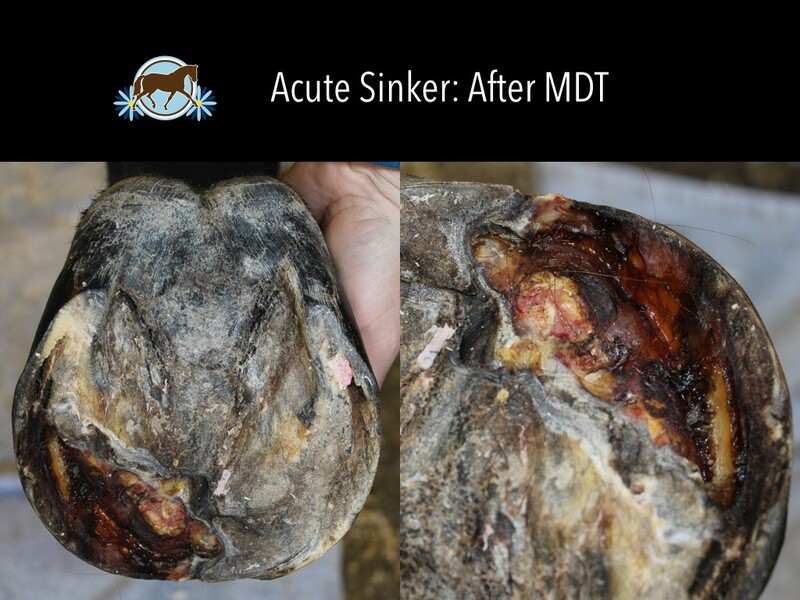 I hope you will consider using MDT when dealing with a horse with a chronic hoof infection, or bring the idea up to your farrier or veterinarian if your own horse is dealing with this issue! 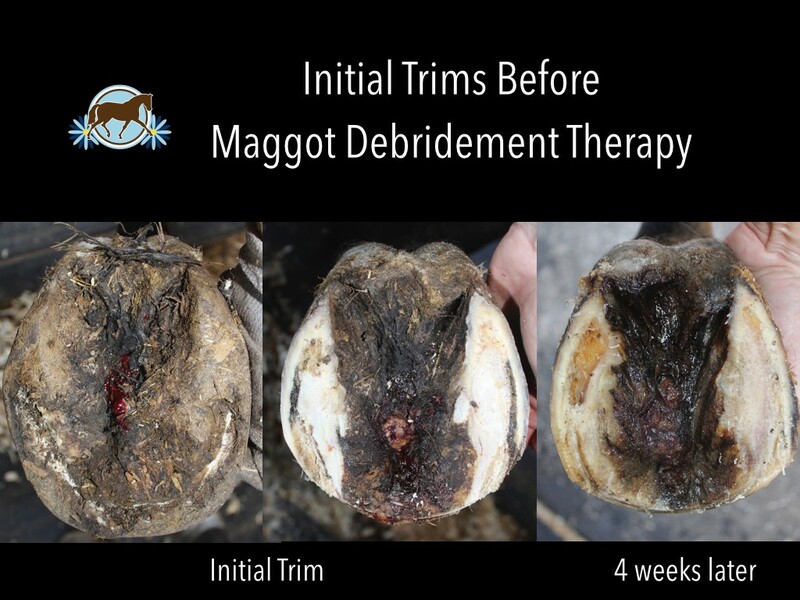 If you would like more information on my method of application, or a copy of the Scientific Poster “Easy Application of Maggot Debridement Therapy To Treat Chronic Abscesses in Laminitic Horses” please contact me.